When installed by an expert, flat roofs are ideal for commercial and residential properties alike. 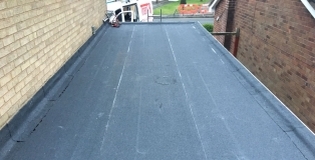 Whether you'd prefer yours in felt, mastic asphalt or EPDM rubber, you can rest assured that the team at Trent Roofing are on hand to complete the job for an affordable price. In the past, we've worked on a wide variety of properties in varying settings throughout Nottingham and neighbouring towns, acquiring invaluable experience and expertise which your home or business can benefit from. Your flat roof has the potential to be more than just a roof. Why not turn your flat roof into a roof terrace, roof garden or walkway? You could also use the area for solar panels. If you're looking to repair or replace your flat roof, then there's no better team to call in the Nottingham area. We're available for flat roofing projects throughout Derby, Ilkeston, Carlton and the surrounding areas - why not call us today for a free quote? "Ben repaired all the roof and cleaned out the guttering and did an all over visual to ensure all the roof was repaired to the best standard. I am really happy with the result, it now looks as if the roof has never has any issues, excellent job." 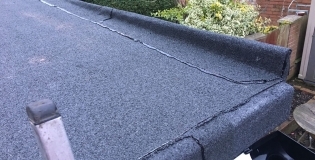 Looking to replace your flat roof in Nottingham, Derby or Ilkeston? Look no further than Trent Roofing - your local flat roof specialists.